4/14 Cup of Coffee: Two top pitching prospects headlined Wednesday's action. However, offense was hard to come by, and each affiliate ended up on the wrong side of the box score. Henry Owens (pictured, right) made his second start of the season and was the tough-luck loser, allowing just one run on two hits and four walks while striking out six in six innings. Jorge Marban added an inning of scoreless relief, and Heath Hembree added two perfect innings, punching out five. Owens threw just 59 of his 99 pitches for strikes. He walked the bases loaded in the second inning, and Eddy Rodriguez (NYY) drove in the lone run with a ground out. Pawtucket only mustered four hits, which were all singles except for Deven Marrero's third-inning double. A quiet night for both teams saw the Thunder break through off of Rob Wort to pick up a tight 1-0 victory. Justin Haley lasted just 4 1/3 innings, allowing six hits and two walks while punching out six. Williams Jerez followed with 2 2/3 innings of scoreless relief, allowing just a hit and a walk. Wort picked up the loss after allowing a solo home run in the eighth inning. Henry Ramos and Jose Vinicio both collected two hits to lead the Sea Dogs. Salem was unable to overcome an early deficit, dropping its second straight to the Keys. Daniel McGrath was chased early, lasting just 1 2/3 innings. He allowed three runs on two hits and two walks. Taylor Grover followed with 3 1/3 innings of relief, allowing a run on three hits. Mario Alcantara added three innings, allowing a run on two hits. Trailing, 4-0, in the fourth inning, Andrew Benintendi jump-started the Red Sox offense with a one-out triple. He eventually scored on a sacrifice fly. In the fifth, Mauricio Dubon's RBI single pulled Salem within two. In the seventh, the Red Sox inched closer, plating a run on a David Sopilka RBI single. Down by two in the ninth, Salem's first two hitters reached, but the rally was quickly extinguished. Benintendi's triple was his fourth of the season, as he has seen six of his ten hits go for extra bases. Anderson Espinoza, the Red Sox' top pitching prospect, picked up the loss. He completed five innings, allowing four runs (three earned) on six hits while striking out five. Espinoza was around the plate all game; he didn't issue a walk and 60 percent of his pitches were strikes. Austin Glorius and Bobby Poyner added two innings of scoreless relief apiece. Down, 1-0, after the first inning, Greenville plated its only runs in the second inning on back-to-back RBI singles from Roldani Baldwin and Kyri Washington. All eight of the Drive's hits were singles, with Luis Alejandro Basabe going 3 for 4 from the lead off spot. 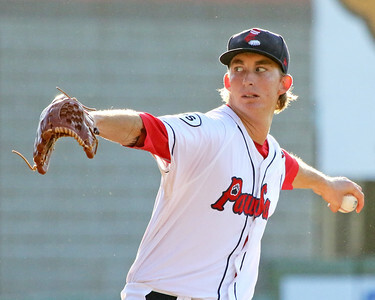 Player of the Night: Despite taking the loss and not being at his sharpest, Henry Owens managed to pitch well in Pawtucket's 1-0 loss to Scranton/Wilkes-Barre. Owens went six innings, allowing just one run on two hits while walking four and striking out six. Over his first two starts, Owens has allowed just three hits, striking out 14 in 12 innings.